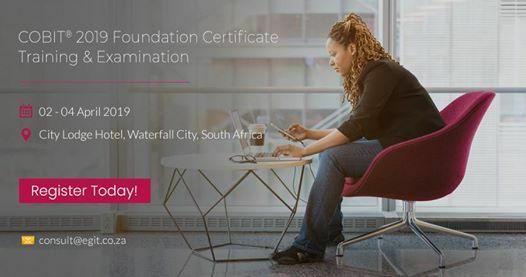 Register Today for COBIT 2019 Foundation Certificate Training & Examination - Become the First to Obtain a COBIT 2019 Qualification!!! 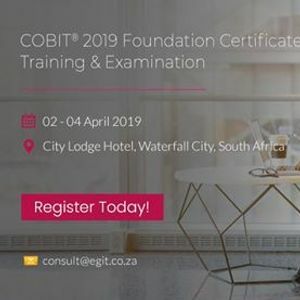 Join us at City Lodge Hotel, Waterfall City, Johannesburg from 02 - 04 April 2019 for a practical hands on COBIT 2019 training. Learn practical real life examples of how to use COBIT for GEIT implementation, Cybersecurity, IT Risk and IT Auditing amongst others. Examination will be taken on the 3rd day. 2019 in-house training opportunities are available should your organisation have 5 or more delegates per course. The advantages of in-house are – venue of your choice, ability to discuss and resolve real issues and dates that suit your work schedule.